Surprise, surprise! Have you ever considered throwing a surprise party or attempted to pull one off? Well, what if you upped the stakes — and instead of *just* a surprise party, it was a surprise wedding?! 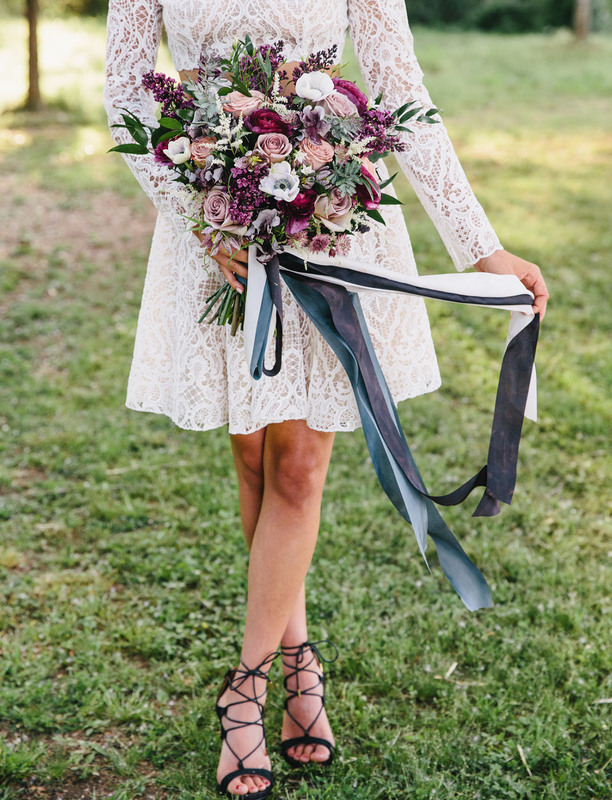 With the right amount of planning, coordination, and maybe a little bit of luck… A surprise wedding could definitely be pulled off! 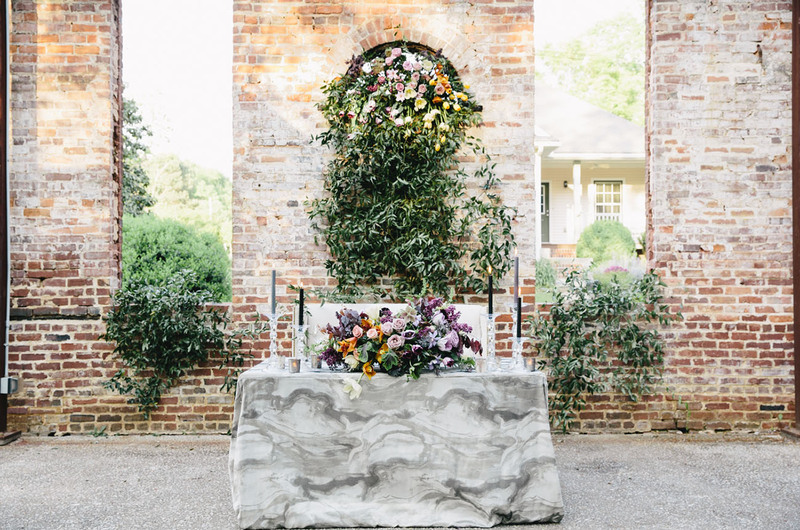 Flowers By Yona, the mastermind behind today’s surprise wedding inspiration shares: In today’s world of social media, it is rare that anything is a true surprise anymore. Especially when it comes to your wedding. 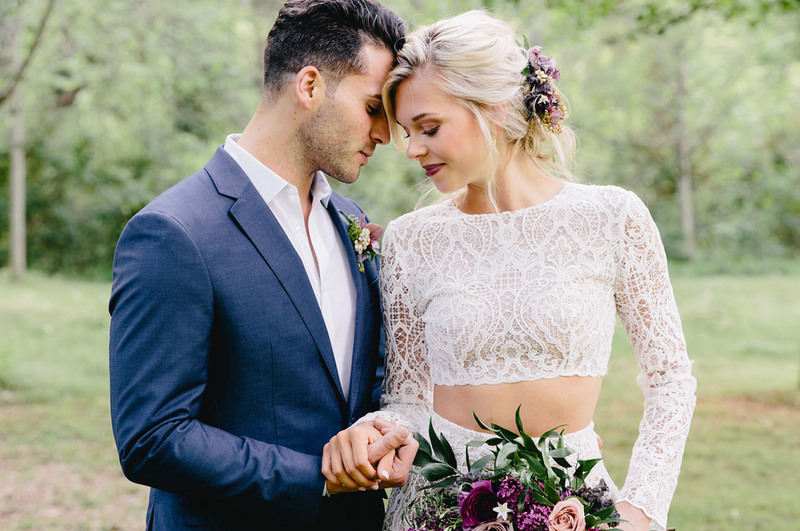 But what if you could pull off the best surprise in the world and create a surprise wedding?! That’s what inspired us for this shoot. 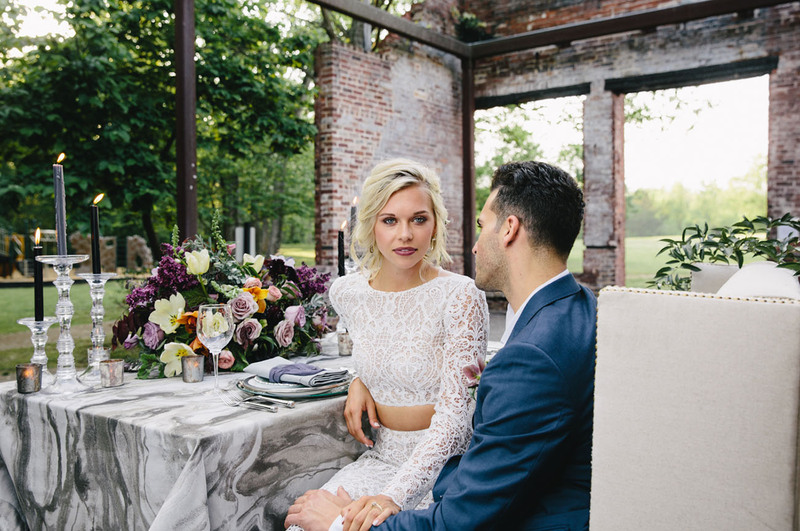 The images not only tell the story of a rock ‘n’ roll, fun-loving, romantic couple, but also the story of how to pull off a surprise wedding from invitations, to appropriate attire, to announcing the surprise, and finally décor. 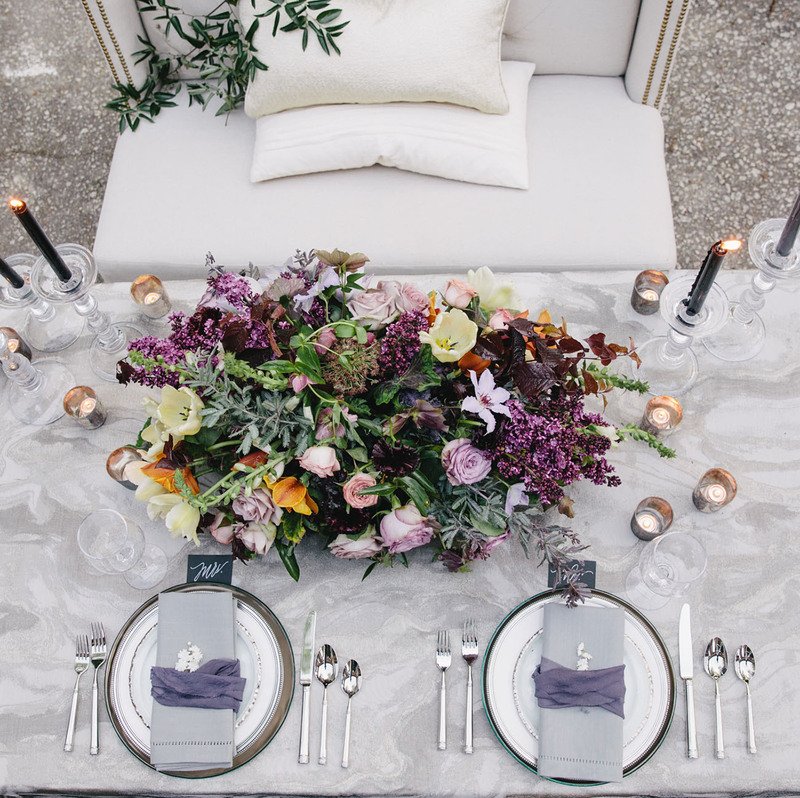 Any couple planning a surprise wedding is clearly the non-traditional couple. So things like a veil or tux would not be the most appropriate. Instead, we played up the fun and funk through a relaxed suit look, a short two-piece dress, romantic hair, dark make-up and moody flowers in the hair. Now onto the details captured by Tin Can Photography! 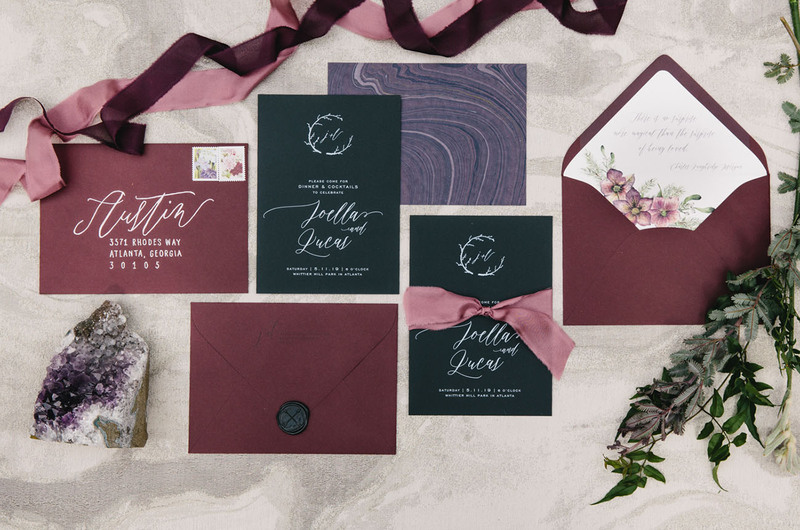 “Please come for dinner and cocktails” — this statement helps guide your guests on how to dress, without revealing the big secret… The rich fall tones of black, burgundy, purple and dusty rose in this invitation suite by Foglio Press helped to set the overall tone for the day. 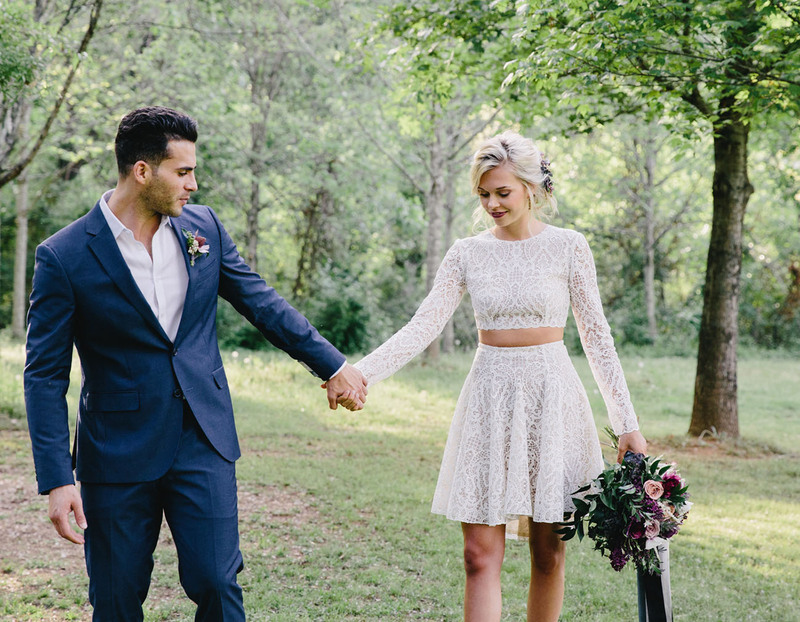 Erin of Tin Can Photography shares: As soon as I saw this two-piece Rime Arodaky ‘Harley & Harper’ dress, I knew exactly who we wanted to shoot for. 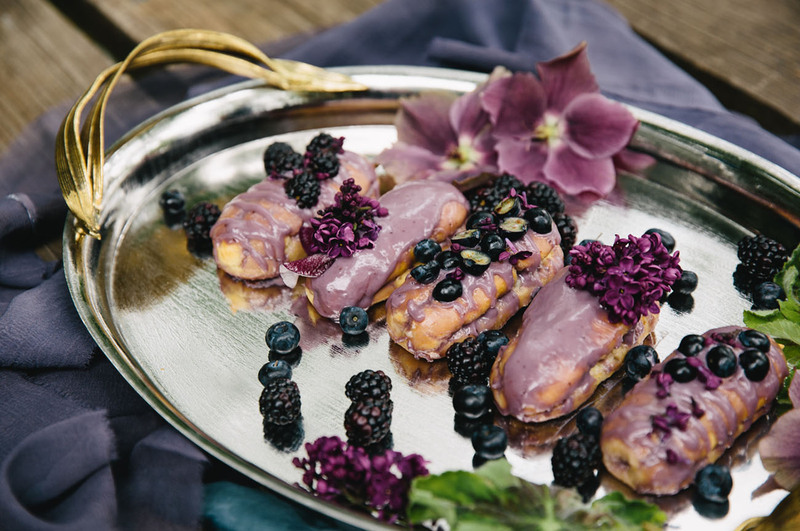 Aiming for the couple this is anything but traditional and loves to put a creative spin on everything, we certainly think the team nailed the concept! NO WORDS. 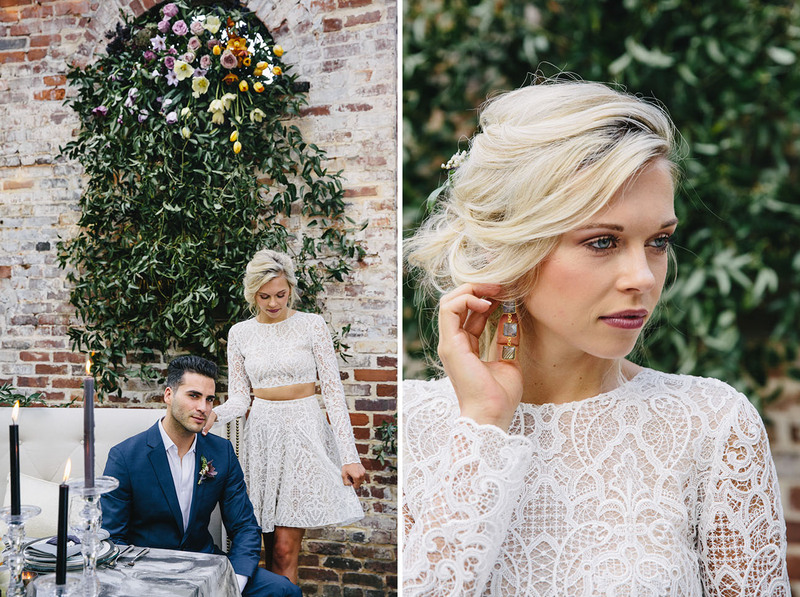 Okay, maybe we have *some* words: beautiful, gorgeous, stupendous, boho chic, glamorous. 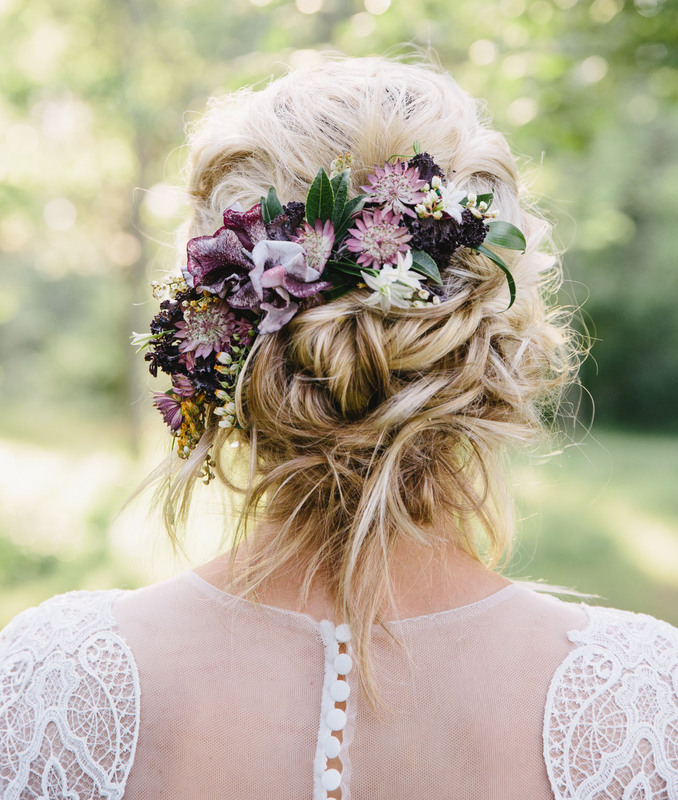 We’re pretty in love with this messy up-do by Jennifer C. Nieman, complete with a floral hairpiece by Flowers By Yona. 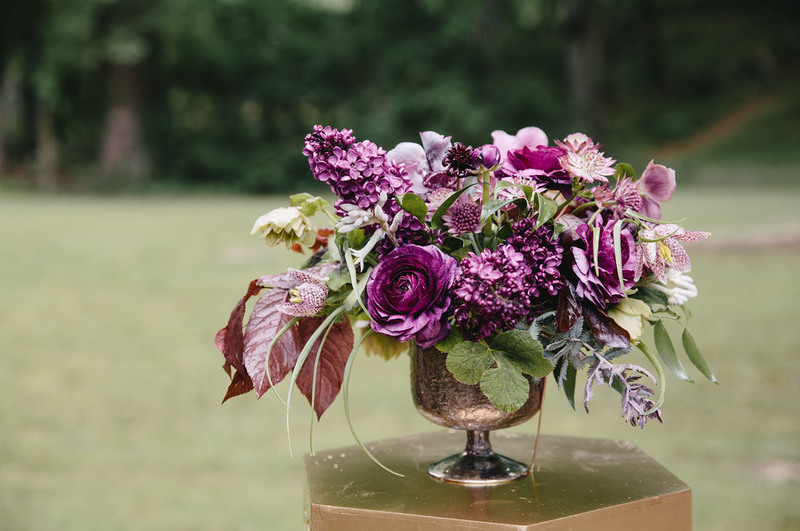 Let’s give a round of applause to Flowers By Yona for crafting one seriously exquisite bouquet! 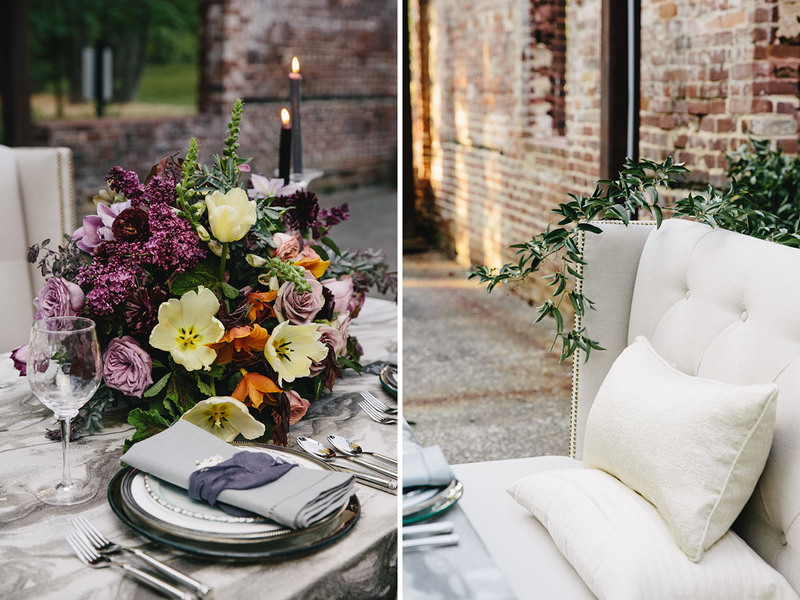 She tells us: We used dark colors in the flowers to complement the old cotton mill ruins at Whittier Mill Park, to make this a perfect look for fall and to play up the moody romance… Because isn’t this kind of surprise one of the most romantic? 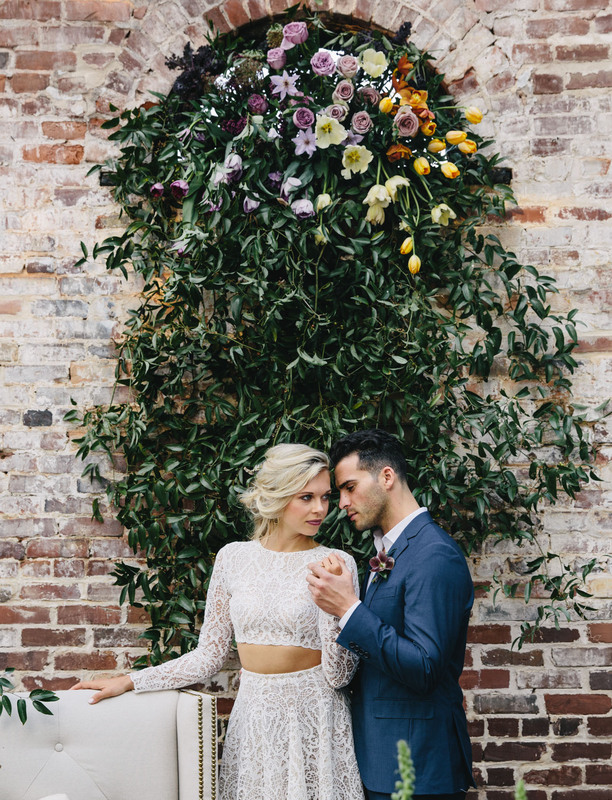 Since the day was meant to be kept under wraps, details were minimal, yet bold. 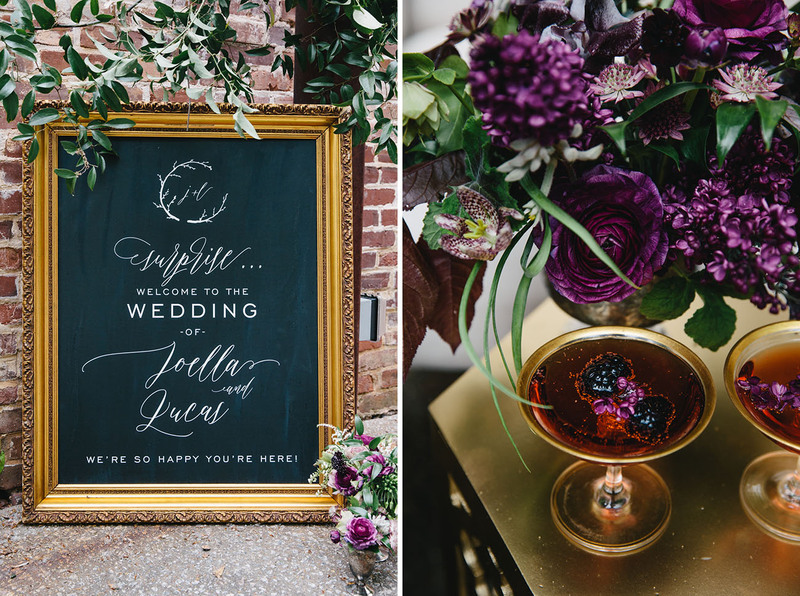 A calligraphy sign such as this one could be crafted ahead, along with pre-made cocktails that you shake up + add berries to as you’re getting ready to serve them. Now for the sweetheart table!! 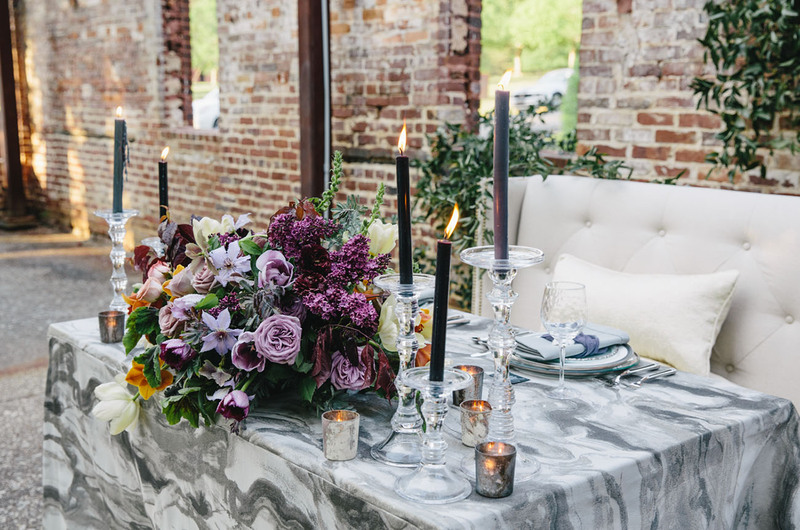 Paired with a marble linen tablecloth from I Do Linens, and a collection of mercury glass votives + crystal candlestick holders from Fragile Gifts, this vignette took on an overall cool, clean, and crisp vibe. Once again, it wouldn’t be *too* difficult to set up this sweet spot on the fly. 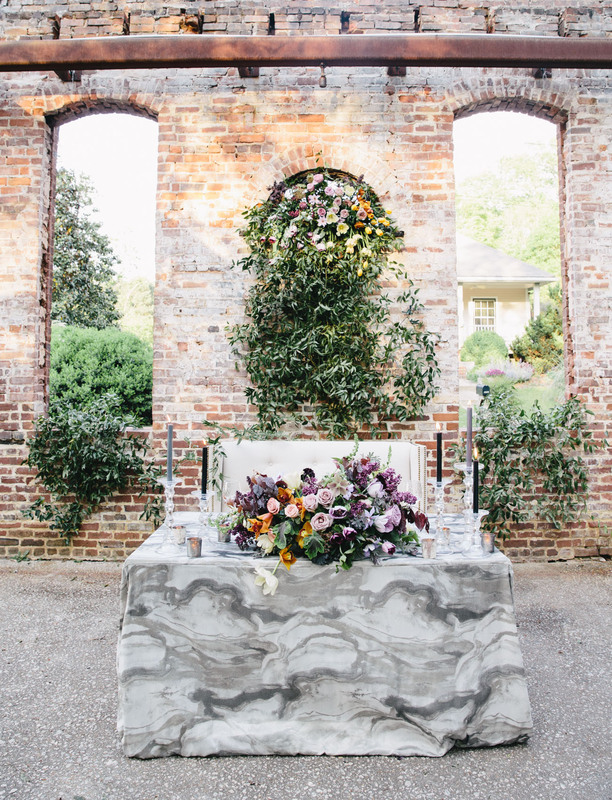 As long as you’ve got the right collection of pieces, put the table/reception space beforehand to see how it all comes together — this could be done rather quickly (which is perfect for the whole element of surprise)! 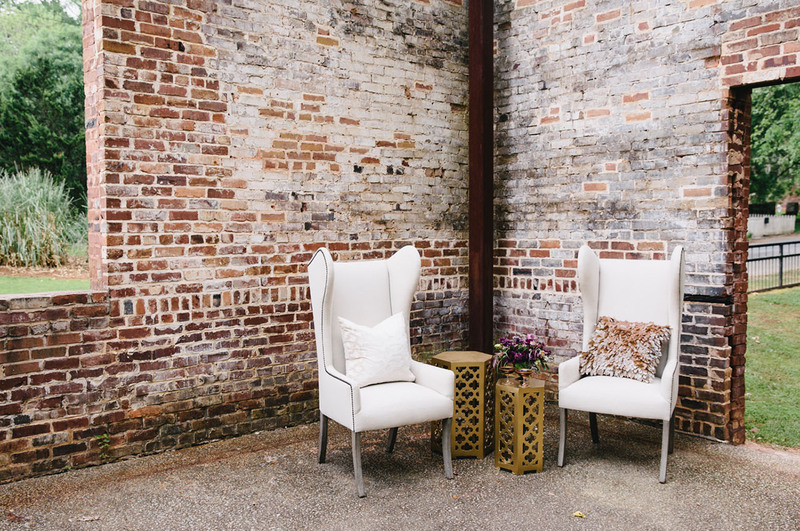 How darling is that settee from Collection Event Rentals? Seriously STUNNING! 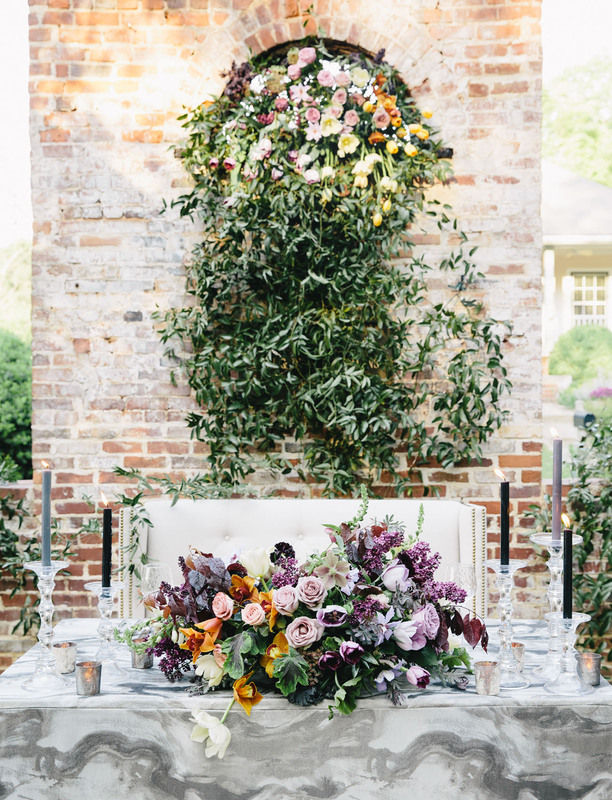 The pops of dark florals contrasted by the golds make for a serious statement + frame the table just right.